I bought this boat in 15 minutes two weeks ago, and have invested about $3000, so far in her purchase, tow, etc. I will meet with a local boat-wright tomorrow to give me an idea of what kind of repair is necessary...this will be a combined effort of his work and advice, and my labor when possible. So, not entirely DIY, but I have to start somewhere. I did not intend to buy a "fixer". This is my first boat and I imagined that I would buy something and hop on. I am not sure what happened...I saw this boat advertised, went to visit and wrote a check. Now, I have to make a decision whether to keep this boat and start pouring money in, or to donate her to a local wooden boat school. I knew I would spend money....but until the haul out I did not realize how much. Again, I will know more tomorrow. I don't know what I am looking for from this group....guidance, moral support, words of wisdom? When hauled, scraped and power washed she exhibited extreme electrolysis damage to everything, including wood. 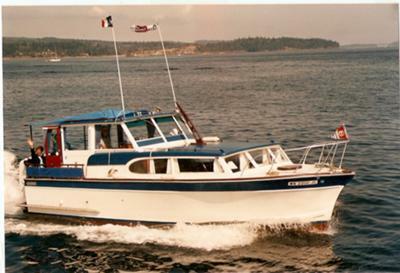 Needed: Planks, transom, and probably much more. Mechanically she is sound and topside, while chippy, was boathouse kept for the past ten years. Your advice and knowledge is appreciated in advance! We build boats because we know that it will be done right, we don't worry when the tempest comes. You rebuild the lower hull and enjoy your boat for years to come. Before getting evolved in a fixer-upper people who enjoy DIY, should go to David Pascoes website. Missy, I can relate to ypour purchase. We found our 57' Connie much the same way. We went to look, and walked away owning her. Take pride in your efforts to preserve a great piece of boating history and keep us informed as to progress. You will never get out of a boat the money you put in, but the experience and enjoyment more than make up for it. Live long and prosper....and stay away from plastic boats. It?s not a good idea to carry your chequebook with on a first viewing Missy, love (especially at first sight) is they say blind. But, hey you have acquired a superb looking boat. As for restoring her, well what can I say, it all depends on how much needs to be done, how much it?s going to cost and what want out of the project. When I started work on Mignonne everyone dismissed the project as impossible and that I?d never get her back in the water. But I did and what I gained from the project is immeasurably more than a just beautiful boat. Yes it took time and money (don?t ask how much as I stopped counting after a while) but it was such a satisfying experience. One option might be to have a word with a local wooden boat school, ask if they are looking for project boats to fix up. I have heard of schools that are prepared come to some sort of agreement (financially etc) to work on people?s boats, as part of job experience.